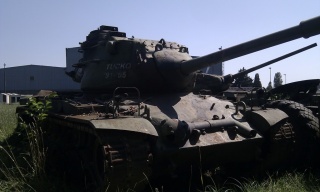 Mejora modernizada del tanque M26 Pershing. Diseñado entre 1948 y 1949. El M46 se produjo en serie desde 1949 hasta 1951, con un total de 1168 tanques con varias modificaciones básicas. Fue muy utilizado en la Guerra de Corea. It is the evolution of the M26 Pershing. The Patton is slower compared to its tier 9 medium tank counterparts, but its maneuverability and powerful 105mm T5E1M2 gun make this tank a pretty hard target to kill. Even though this tank doesn't have enough armor to take direct hits without damage, its frontal turret position and quick acceleration, combined with its low gun dispersion, allow it to be one of the true masters of creating protection though exploiting the surroundings. By effectively determining when to take on targets or shots of opportunity while focusing on best supporting the team as a whole through the Patton's strengths, the determined player is a positive force on the team's odds of success. 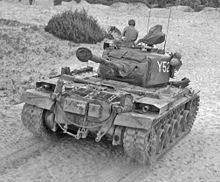 Compared to its tier 9 medium tank counterparts, the Patton is an exploiter and force multiplier, able to effectively boost the sight-lines of other tanks and deliver critical punishment at key times. 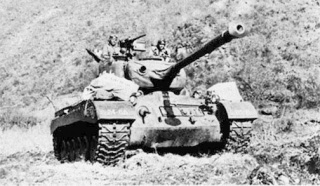 In many ways the M46 Patton is basically a M26 Pershing with a much better gun and slightly better mobility. Just like the Pershing, it could excel as a flanker, support, sniper (not as good sniper as the Pershing because of the mediocre accuracy on the 105) and brawler. Use your superior reload time to shoot heavier tanks (like E-75 or IS-8) twice while only taking one shot yourself. Use your higher alpha to outgun opponents such as the T-54 with a lower alpha. Use your depression and come out of a hill, aim, take a shot, and back off to reload. Just don't expect to lead charges in this tank, because people tend to shoot the Patton first since they know how thin the armor on the Patton is. Just like the M26 Pershing, the Patton 46 can passive scout, except even better. With 410m view range (2nd highest in-game) and increased mobility, the Patton 46 can even scout aggressively. Of course one should only put this plan to action once most enemies have been knocked out. In addition, this tactic is not viable if you are the top tier and only a few allied tanks remain. Unfortunately, because of the 500m view range limit, Coated Optics are more useful, as you will get more out of your exceptionally good view range. From here, research the 105 mm Gun T5E1M2 for extra damage and penetration, the M46T119 Turret for higher view range (keep in mind that the front armour is slightly worse than that of the stock turret), or the top engine (assuming you haven't already researched it).